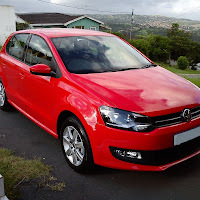 When VW announced the release of the new Polo, I decided to attend the launch at Alpine VW in Pinetown. Displayed on the showroom floor where the various models available. Initially you don't see much of a difference, that's because cosmetic wise the new Polo is just a facelift of the previous version. Well, it's not much of a facelift either, basically it's just a new front bumper. Although the chrome trimming does add a new flare to the design. But the main reason that the new Polo has been launched is so that VW can introduce their new power plant to the range, bringing power and economy to their compact hatch segment. Across the Polo range you will have only one engine capacity option in the form of a 1.2 litre engine block. All of them turbo charged but producing 66kw of power and 160nm of torque and the Highline and Cross versions are tweaked to push out 81kw and 175nm of torque. Our test drive option was the TSI Highline DSG, and we were accompanied by Senior Sales Executive, Bronwyn Morgan, from Alpine VW in Pinetown. Like I said earlier, theres not much to talk about when it comes to the exterior, save a few changes, like the Highline comes standard with a smart set of 16" alloys and 215/45 tyres that give it a sporty look. Across the range the brakes have been upgraded to discs all around. Inside you get the same layout, however the radio has been upgraded to a touch screen media centre, supporting usb, SD and auxiliary inputs over a six speaker system. Pretty decent setup, a bit of high end technology to bring out the youngster in you. You still get the feel of quality and comfort, and the leather finishes are soft to the touch. The one thing that I really liked, was the inclusion of the card holder. This used to be a feature in the '06 Polo, and I found it very conveinient as I used to travel a lot. The whole range comes standard with various versions of cloth interior, and I don't see leather being offered as optional, if you want leather the dealership will probably offer it to you as a after market optional. Another big change inside the car is the front centre armrest, which gives it a sort of luxury feel. Although I feel that this in reality makes the cabin look a bit cluttered, considering the already restricted room. This time our test route was the infamous M19 highway a.k.a. Back Stretch. I like the route due to the winding uphill and downhill, you really get to test all aspects of the cars performance, handling and economy. Modern technology and the numerous small engined cars out in the market gave me an insight of what to expect from a 1.2lt turbo charged engine. However the Highline is tweaked a bit further and totally blew me away from the word go and the best part was that the 7 speed DSG transmission did well to make the drive seem like the the M19 was a walk in the park. Power and handling fused well together and resulted in a driving experience that you'd expect from the Polo's bigger brothers like the 1.4TSI and Highline versions. Although 81kw seems not so impressive, you must take into consideration the power to weight ratio here and appreciate what VW have accomplished. Halfway back on the uphill of the M19 I decided to see what the 1.2lt engine can do for me on the economy side. The manufacture claims a combined 5.1l/100kms, and I managed a 6.9l/100kms, and this was done on the steep uphill of the Back Stretch, ...amazing! The build is just as solid as it's predecessor and includes high quality finishes making the Polo great value for money and giving it excellent resale value. 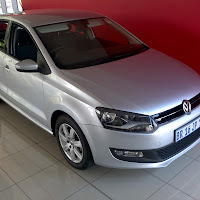 The 2015 VW Polo 1.2 TSI Highline DSG crosses the finish line at R247 800.00 and will get you a 3 year/45000km service plan, a tad bit short if you ask me, but it's something, considering previous models didn't come with any. I would suggest that you spring the extra R10000.00 cash to upgrade it to a 90000km/5 year service plan, and I'm sure you can negotiate the final cost on your vehicle. If you're considering a compact hatch, do yourself a favour and book a test drive with the new Polo range, I'm sure you will be impressed.